The simple worm C.elegans may harbour an ancient form of parental behaviour. Modern neuroscience has long been smitten by the idea of identifying how the brain and its complex array of nerve cells bring about social behaviour. There are several levels of social behaviour but perhaps the most primitive are those that make parents act to ensure the well-being of their off spring. Indeed maternal instincts (sorry Dads) are recognised as among the most potent of behavioural drives. 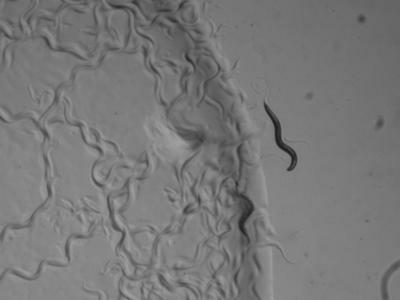 Now, researchers at the University of Southampton together with colleagues at the National Infection Service, Porton Down and KU Leuven in Belgium, have recognised that the simple worm - C.elegans (approximately 1mm in length) - may actually harbour an ancient form of parental behaviour designed to benefit their offspring. University Professor of Neurochemistry, Vincent O’Connor, who jointly led the work with Professor Lindy Holden-Dye, Chair in Neuroscience at Southampton, and Matthew Wand from Public Health England, described how the colleagues reached their conclusions about the ‘caring’ behaviour exhibited by the worms. “The worms lead a simple life in which they feed off the bacteria that exist in the fermenting environments they live in,” explains Professor O’Connor. “They perpetuate generations using a life cycle in which adult worms self-fertilize and lay their off spring into the bacteria. This immediately sets up a conundrum, as the parent will be competing for the same food source as their off spring. “The research shows that before the food source becomes limiting, the parents recognise their offspring and execute a food leaving behaviour to benefit their off spring,” he continues. “Importantly, and enabled by the experimental virtues of the worm, the research shows this is dependent on the hormone nematocin, the ancient nematode version of a human hormone called oxytocin. These hormones are known to regulate sociability and have been called the ‘love hormone’. “So it would appear that behaviours that ensure our parents are keen to see us eat well have morphed from the ancient organisation of simple nervous systems such as those found in worms,” Professor O’Connor concludes. The paper An oxytocin-dependent social interaction between larvae and adult C. elegans is published in Scientific Reports (DOI: 10.1038/s41598-017-09350-7). Click here to download the paper.